Putting a new roof on your home can help increase your homes overall value, especially when there has been weather damage to it. We here at Eastbrook construction want to give you some handy tips and tricks and advice from our blog. We’ll write a little bit about how you can get the most value out of your roofing project, a new roof or how to maintain and take care of the roof you just got. For this blog, we will talk about why you should invest in a new roof and how it helps your curb appeal. Home construction can be a mixed bag, but having a nice roof will always pay off. Adding a new roof onto your house will be a good investment that will pay off in the short and long run. 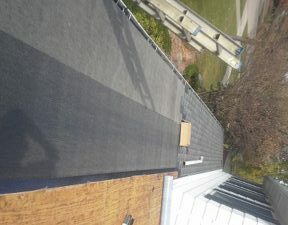 If you have leaks, damage from storms or tile that needs replacing you should highly consider getting a new roof put on. These types of “minor” things can lead to much bigger problems in the long run. Like the old saying goes; an ounce of prevention is worth a pound of cure! Water damage isn’t a gamble you want to take, especially when you’re looking to sell your house at some point. Structural damage, mold, and higher utility bills are just some of your worries you’ll have to deal with when your roof is leaking. How does getting a new roof increase the value of your home? Getting a new roof to replace the old damaged roof will not only be preventing damage to your house, but if you are selling your home, you can also tack on much of the cost of the job (depending on how long after you sell), to how much you ask for when selling your house. Some people have been able to see the value of their house increase anywhere from 15% – 25%, or even more of their original value. Besides, you can’t sell a house that has a leaky roof and structural damage and expect to get the most out of your investment. Another factor in putting that new roof on is its curb appeal. You’ll want your house to look perfect from the street, and having a nice roof can help you do that. Putting a new roof on can be intimidating to any home owner, you’ll want to know what you’re getting yourself into before committing, we understand. That’s why you can contact us to set up an appointment for us to come out and give you an accurate quote and answer any questions on the spot. So, if you have a home in Michigan and are looking for a local roofing company, please contact us today and we’ll help you get the most out of your home! This entry was posted in Home construction, New Roof, Roof repair and tagged damaged roof repair, Increasing curb appeal, increasing home value, local roofing company, roof companies Michigan. Bookmark the permalink.